Taruntius is a lunar impact crater on the northwestern edge of Mare Fecunditatis. It was named after ancient Roman philosopher, mathematician and astrologer Lucius Tarutius Firmanus. To the northwest is the lava-flooded crater Lawrence, and to the north lie the craters Watts and da Vinci. The surface about Taruntius has an unusual number of ghost craters and lava-flooded features, especially to the southwest in the Mare Fecunditatis. The outer rim of Taruntius is shallow, but forms a veined, complex rampart in the nearby mare, especially to the north and southwest. The rim is broken in the northwest by the small crater Cameron. The inner rim face lacks terraces, but in the interior is an unusual concentric inner rim that is heavily worn and irregular. This is a floor-fractured crater, possibly created by an uplift of mare material from beneath the interior. There is a low central peak complex in the middle of the relatively flat interior floor. There are also some slender rilles that are concentric to the rim. The crater has a pair of faint dark patches. One patch is located just south of the central peak and the other falls on the sides of the northern rim near Cameron. These were likely created by deposits of volcanic ash from small vents. Taruntius has a ray system with a radius of over 300 kilometers. Due to these rays, Taruntius is mapped as part of the Copernican System. By convention these features are identified on lunar maps by placing the letter on the side of the crater midpoint that is closest to Taruntius. Taruntius A — See Asada crater. Taruntius C — See Cameron crater. Taruntius D — See Watts crater. Taruntius E — See Zähringer crater. Taruntius G — See Anville crater. 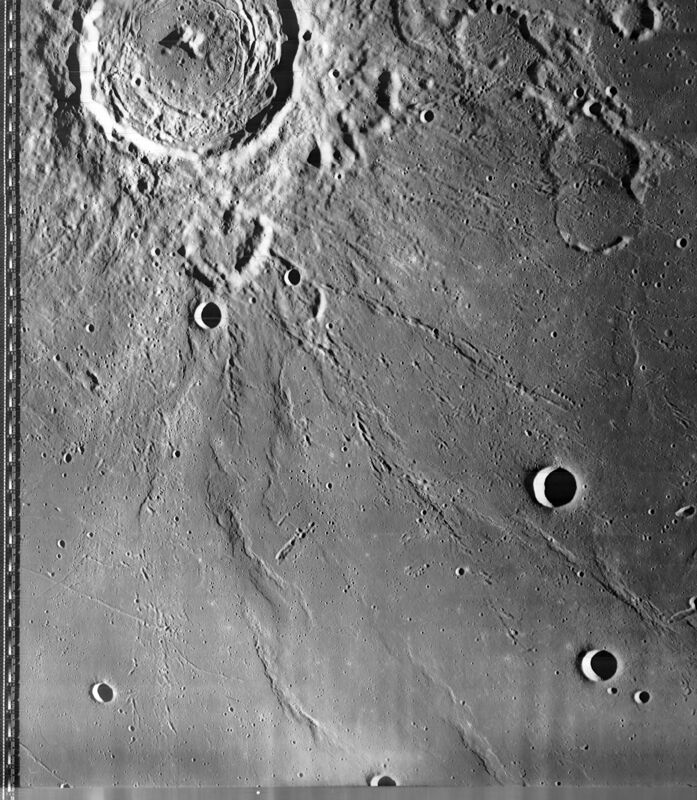 Taruntius M — See Lawrence crater. Taruntius N — See Smithson crater. ^ "Taruntius (crater)". Gazetteer of Planetary Nomenclature. USGS Astrogeology Research Program. Donne, William Bodham (1870). "Firmanus, Tarutius". In Smith, William. Dictionary of Greek and Roman Biography and Mythology. 2. p. 151. Wikimedia Commons has media related to Taruntius (crater). Lunar Orbiter 1 View of most of Taruntius and the area to the southeast showing many secondary craters. Wood, Chuck (2006-09-19). "Terrific Taruntius". Lunar Photo of the Day. Archived from the original on 2007-09-27. Retrieved 2006-09-19.